Working for the Grace Shannon Balloon Company from 1893 through 1895, fearless Rubie Deveau thrilled crowds with her aerial acrobatics, ascending in a hot-air balloon until she “looked like a speck in the sky” and then parachuting back to earth. Like many other aerial pioneers, however, her career was short lived. After 175 successful jumps, she was caught in an unexpected air current during her final descent and landed against a brick chimney, breaking her back. She was just eighteen. After she recovered, Deveau homesteaded in McIntosh, South Dakota, before marrying and moving to Missoula in 1925. Early aerialists, including Rubie Deveau Owen, possessed an adventurous spirit that often overwhelmed reason. The list of those hurt and killed is distressingly long. Nevertheless, flight remained an exciting curiosity, with airplane manufacturers feeding the public’s interest through exhibitions at fairs and other events. Both men and women participated in these exhibitions. In 1913, just three years after Bud Mars made Montana’s first recorded flight in an airplane, Katherine Stinson performed at the Helena fairgrounds. On a tour promoting the idea that the U.S. Postal Service could use airplanes, she thrilled crowds at the Montana State Fair, not only by performing stunts but also by flying bags of mail from the fairgrounds, which she dropped onto Helena’s downtown post office. Officially designated “the postmaster of the fairgrounds,” she thus became one of the first to deliver airmail in Montana. Montana women soon got into the act. Born in Billings in 1901, the headstrong only child of a prominent family, Maurine Allen loved mechanized travel, often taking her father’s car on trips through Montana’s countryside. In 1927, she enrolled in a five-month flying course at Rogers Aviation School in Los Angeles. 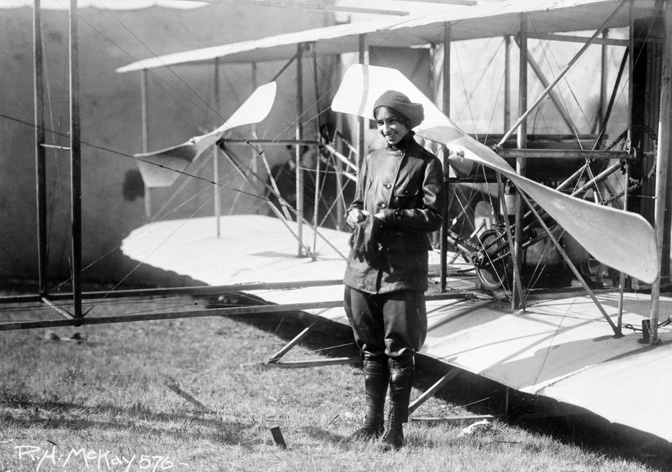 According to the Billings Gazette, she was one of the first women to earn her pilot’s license in California. Allen returned to Billings in March 1928 to great fanfare, with local newspapers reporting that her skills as a female pilot, stunt flyer, and even wing-walker had captured the interest of movie executives. Desiring to be more than a stunt pilot, Allen returned to Montana hoping to earn a commercial license so she could work for the fledgling Yellowstone Air. It is unclear if she achieved her goal. Her boldness may have derailed her, for she had five forced landings during the next four years, and her flying career ended soon after. While Allen received her license in California, Esther Combes Vance was the first aviatrix to receive her pilot’s license in Montana. Born on August 19, 1903, in Clinton, Indiana, Esther moved as a young girl to Sidney, Montana. In 1921 she graduated from Sidney High School; four years later she married a former World War I combat pilot and barnstormer Earl Vance. On July 17, 1928, the U.S. Department of Commerce issued Esther Vance private pilot license number 3180. A year later, she became the twenty-second woman in the nation to receive a limited commercial license, which allowed her to carry passengers for Vance Air Service. In an effort to connect professionally and socially, and to advance their cause in aviation, in 1929 female pilots across the country formed the Ninety-Nines. As a charter member and regional chapter chair, Vance actively served the organization. The records she kept indicate that, even by the mid-1930s, Montana had only three licensed female pilots—commercial and personal. 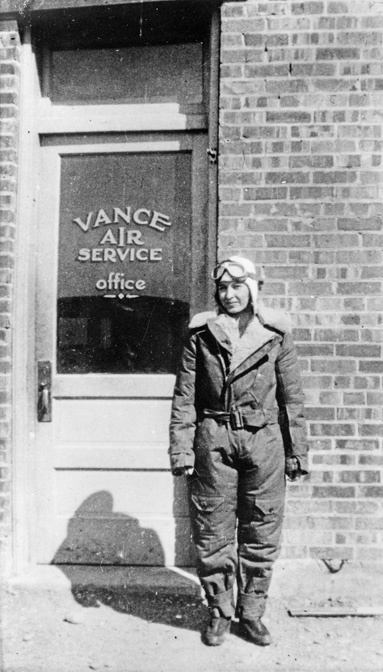 Vance remained connected to the Ninety Nines throughout her life and established an organization scholarship for aspiring female Montana pilots that is still offered. Like Esther Vance, Ruth Marie Hladik Nelson Dean embraced aviation during the late 1920s, not only as an exciting pastime, but as a practical career. Born in Iowa, Ruth grew up in Harlowton and Missoula. In 1926, she married Frank H. Nelson and moved to Butte. Tragically, Frank died on January 15, 1928, and at age twenty-four, she found herself widowed. A month later, in February 1928, Ruth Nelson had her first airplane ride. She felt sick as pilot Robert Johnson, of the Johnson Flying School in Missoula, “indulged in dips and rolls.” Despite this inauspicious beginning, she returned to the sky, logging two hundred flights, including twenty-five solos, by November of the same year. In addition to the art of flying, she “familiarized herself with . . . every department of airplane operation, with a view to fitting herself for the life of a first class pilot.” Although she briefly managed a flying school, her flying career proved short-lived. By 1933, she was working in a more traditional profession for women: as a corsetiere at Fisher’s Millinery in Helena. Like their counterparts throughout the nation, Montana’s early “Queens of the Clouds” received public accolades and attention from the press. They realized a freedom in flying that released them from social expectations. Their celebrated achievements, however, were presented as curiosities, and only rarely resulted in long-term careers. Airplane manufacturers promoted female pilots to prove that “anybody” could learn to fly a plane. However, once they achieved their licenses, many women pilots found the industry inhospitable. In 1930, licensed female pilots nationwide numbered about two hundred, and through that decade their numbers only slowly increased. Billings (Mont.) Gazette, March 10, 1928. Great Falls (Mont.) Leader, June 6, 1928. Great Falls (Mont.) Tribune. 125 Montana Newsmakers Series, http://www.greatfallstribune.com/multimedia/125newsmakers1/vance.html. Helena (Mont.) Independent Record, March 12, 1928.
International Society of Women Airline Pilots. “Frequently Asked Questions,” http://www.iswap.org/content.aspx?page_id=275&club_id=658242&item_id=1506&ad=yes. Accessed online October 11, 2013. Missoula (Mont.) Daily Missoulian, September 21, 1913. Montana Standard (Butte), November 24, 1928. Pawlowski, A. “Why Aren’t More Women Airline Pilots?,’ CNN Travel, March 18, 2011. http://www.cnn.com/2011/TRAVEL/03/18/female.airline.pilots/. Accessed online October 11, 2013. Vance, Esther Combes. Papers, 1904-1977. Montana Historical Society Research Center. Wiley, Frank W. Montana and the Sky: The Beginning of Aviation in the Land of Shining Mountains. Helena: Montana Aeronautics Commission, 1966. After they married in 1925, Earl Vance taught his wife how to fly. They had an exciting barn storming career as well as operating the Vance Air Service from their own airstrip on north of Great Falls.